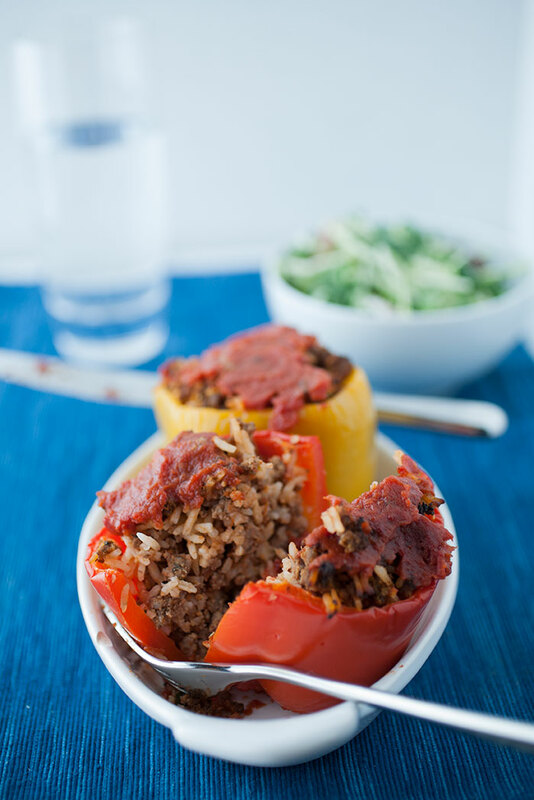 Stuffed peppers make such a fantastic weeknight meal. They’re simple and easy to make, they don’t require a lot of prep, and you can make them any way you want! 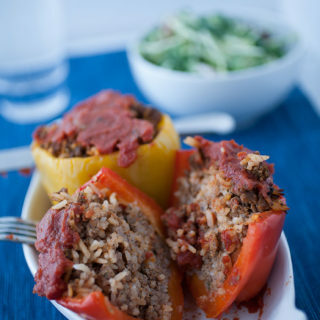 Which is why I’ve created this do-it-yourself guide to stuffed peppers! 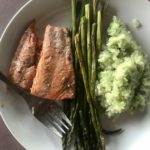 Start with the basics and add away to your heart’s (and cravings’) content! Of course, you start with the peppers. Cut off the top, take out the core and seeds and place them in a baking dish with a layer of tomato sauce on the bottom (it adds flavor and keeps the peppers from sticking to the pan). Next, you’ll want some sort of ground protein, whether it’s beef, chicken, tofu, or something else. You can sauté it with chopped onion and garlic if you’d like, but that’s optional. Then, I add the spices. For the stuffed peppers in the pictures, I used a mix of salt, pepper, cumin, Italian spices, and a bit of peri peri spice for some heat (what can I say—we love our heat). After that, I sneak some greens and/or other veggies in! Something like kale, finely chopped zucchini or yellow squash, little bits of broccoli, etc. Finally, I add some type of cooked protein. My favorite to add is some type of cooked rice or other grain, whether jasmine, sushi, or wild rice. 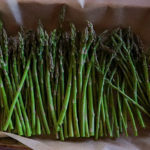 You could also add something like quinoa or farro. Finally, you’ll add some sort of tomato sauce or another sauce like teriyaki to the mixture as well as the pan and, finally, on top of the peppers once they’re stuffed. It adds flavor and keeps the stuffing from getting too dry while the peppers are cooking in the oven. Finally, I would recommend sprinkled a bit of cinnamon on top of the stuffed peppers, especially if you’re using ground beef and tomato sauce. There’s something about the cinnamon that just adds a needed flavor to the filing and peppers and sauce. 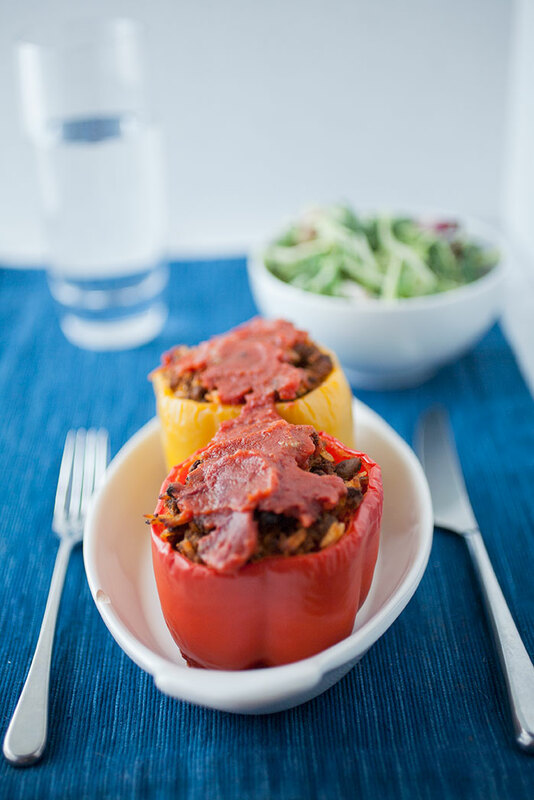 Do-it-yourself stuffed peppers: they’re quick, easy, delicious, healthy and you can customize them to your heart’s content using this handy guide! Pour a half a cup to a cup of tomato sauce into the bottom of a loaf pan. Cut the top of the peppers off, then take out the core and seeds. Place into the loaf pan. Preheat olive oil in a pan over medium heat. Sauté the onion and garlic until softened, if using, then add the spices and sauté the protein until cooked through. Remove the protein to a plate, then sauté the veggies until soft. Turn off the heat, add the protein back to the pan, then add the rice or gain and half of the tomato sauce. Mix to combine. Spoon the filling into the peppers. Overfilling is fine. Sprinkle cinnamon on top, if you’d like. Then, spoon a bit of sauce on top. Place the peppers in the oven for about 45 minutes, or until the peppers are softened. Take the peppers out of the oven and spoon a little more of the sauce from the bottom of the pan into the top.